“Suspect in Tampa serial killer case apprehended and charged with four counts of murder” read headlines across various Florida newspapers this week. We’ve been wondering about the identity of this previously nameless killer since late October and now we have a name: Howell Emanuel Donaldson III, nicknamed “Trai” by friends. Donaldson went on a killing spree in the Seminole Heights area picking out seemingly random targets who were walking alone along the same bus route on the night of their murders. If you’re unfamiliar with the case and haven’t been following it in the news, take a look at the previous 2 entries here on the generation why blog>> Here and Here. So what have the reports been saying about the man who took the lives of four Seminole heights residents during his 51 days of terrorizing the neighborhood? Donaldson is a 24 year old male, who was employed at a McDonald’s fast food restaurant on 2101 East 13th avenue. He attended Alonso High in Tampa before getting a college education at St. John's University, New York. The young man had a spotless criminal record and was described by those who knew him as mild mannered and friendly. “A regular guy, a wallflower” one friend commented. He was polite when questioned by authorities regarding his role in the murders with investigating officers telling the media he was “fine”, alert and aware. Those who were acquainted with him could not recall any past instance of violent behaviour- verbal or physical. One friend of Donaldson even admitted to CNN that he had never even heard the alleged killer use bad language. 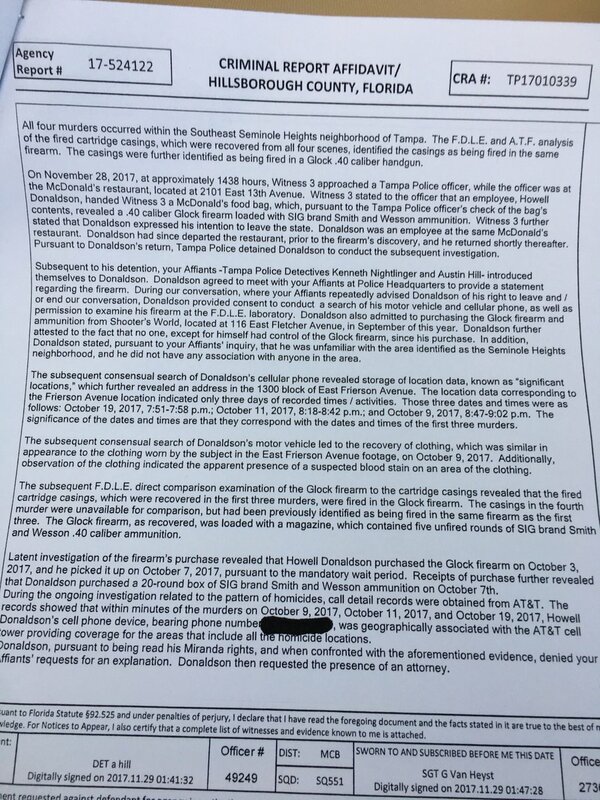 According to the arrest report (here) Donaldson doesn’t appear to be a resident of Seminole Heights, as was suspected before he was apprehended. The report lists his address as Millwood drive, Tampa. When questioned by police he told them that he had no connection with the Seminole Heights area and had never been a resident. Criminal profilers interviewed about the case suggestion that some kind of connection with the area may be revealed in the future. Donaldson was apprehended on the 28th of November when he handed what is believed to be the murder weapon and unspent ammo in a take-out bag over to the manager (Delonda Walker) at the McDonalds restaurant he worked at. He said that he had to go to the bank and would be back soon, but also mentioned that he planned to leave and travel to another state. His co-worker wasted no time in turning over the firearm to a police at around 2:40pm that afternoon. Officers took in Howell Emanuel Donaldson for questioning. Walker is expected to collect a hefty reward for giving Donaldson up to the authorities. Donaldson is now known as “The Seminole heights serial killer” and “The Tampa bay serial killer”. He has not yet (as I write this) confessed to the 4 murders, but the bullets found in all four victims match those Donaldson handed over to Walker for safe keeping. 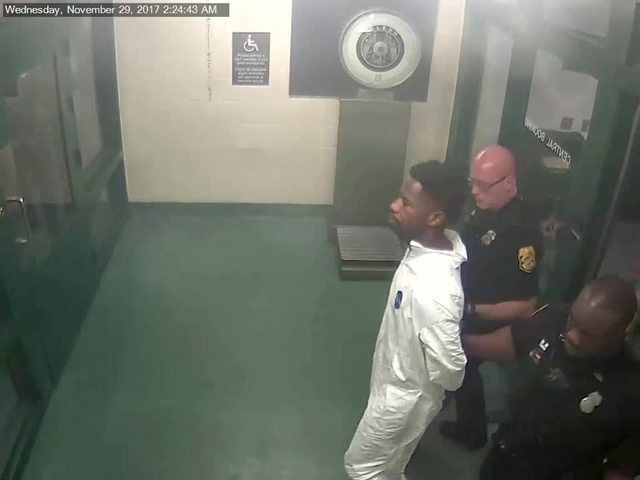 The alleged Tampa serial killer has admitted that the semi-automatic pistol is indeed his weapon and further ballistic tests will be performed to confirm if the firearm is indeed the murder weapon. Local police have stated that they are confident they have the killer. According to this report he legally purchased the SIG brand Smith and Weston .40 caliber on October 3rd 2017 from “Shooters world” on 116 East fletcher Avenue. In accordance with gun laws he collected his ammo a few days later. The first murder happened a couple of days later on the 9th and Donaldson's actions up until the killings show clear premeditation. Analysis of Donaldson’s cell phone revealed that he was at all three locations on the same nights as the first 3 murders. A search of his car turned up an article of clothing with blood present that matched the clothes of the suspected killer captured on surveillance tapes. Due to this evidence, authorities are confident that they have their man, and believe there was nobody else involved. His family have spoken publically about how devastated they are by the actions of their son and how heartbroken they feel for the families of the victims. The said in an interview that they want their son to know that they love and support him and that they intend to lean on their faith during this troubling time. Donaldson is currently being held at the Hillsborough county jail without bond and could face the death penalty if convicted.